You are at:Home»Daily Look»Is the only way up for EUR/USD? EUR/USD continues trading in a narrow range after the ECB dovish stance faded away and so did other events. Technically, what’s next for the pair? 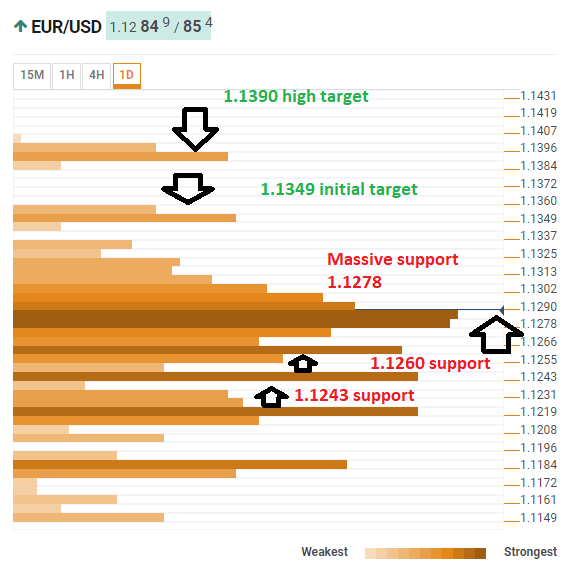 The Technical Confluences Indicator shows that EUR/USD enjoys massive support around 1.1278 and the surroundings where we see the convergence of the Fibonacci 38.2%, the Bollinger Band 15-min Lower, the Fibonacci 61.8% one-day, the BB 1d-Middle, the Pivot Point one-day R1, the BB 4h-Upper, the Simple Moving Average 5-15m, the previous daily high, and many more. Further support is quite close. At 1.1260 we note the convergence of the previous weekly high, the previous 4h-Low, the Fibonacci 23.6% one-day, and the SMA 5-1d. The pair is further backed up by 1.1243 where the SMA 10-1d, the PP 1d-S1, and the Fibonacci 23.6% one-month converge. Looking up, EUR/USD will need to make its way through many lines of resistance, but the path eventually clears and the initial upside target is 1.1349 where the Fibonacci 61.8% one-month meets the SMA 100-1d. The next upside target is 1.1390. It is the confluence of the PP one-month R1 and the BB 1d-Upper.